WJET will lay off five techinicians at the end of August. The layoffs mean more than fewer jobs in Erie. 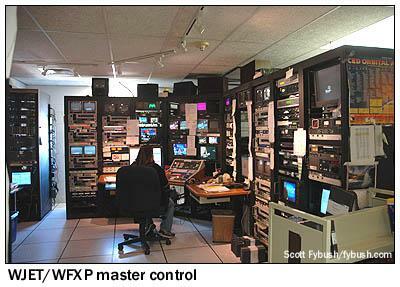 At the end of August five master control operators (MCOs) at WJET/FOX66 will lose their jobs. The company announced the layoffs to its employees in June. Each of the affected staff are members of NABET-CWA, the television employees union that represents workers at WJET/FOX66 and Lilly Broadcasting. WJET's parent company, Nexstar Broadcasting, is outsourcing master control operations to Memphis, Tennessee, where Nexstar has a broadcast hub. Broadcast hubs are used to consolidate television operations for multiple television stations in different geographic regions remotely controlling on air programming in local markets. It's a trend among television station ownership groups looking to maximize profits by reducing local staff. The trend is a result of technological changes in broadcast equipment and the incorporation of fiber optic networks that allow for faster transmission of commands to servers that control on air content. In Erie this means that there will be fewer jobs in television. In Memphis this means that there are fewer people doing more work as the hub takes on more stations and more responsibility. If the pirate capitalist in you is screaming because you see this as some sort of market based "correction," sit tight. There are some potentially serious real world consequences. MCOs are more or less the technical brains of a television operation. They time all of the programming so that shows run in 30 minute segments with the correct commercials running at the appropriate times. When your television screen goes black in the middle of the Steelers playoff game. The MCO gets the game back on the air. When severe weather is about to hit the region on a Saturday afternoon when no one else is in the television station, the MCO pushes the button to send the weather alert across television screens in the viewing area. When an MCO in Memphis is timing programs for stations in Idaho and California while monitoring the live commercial breaks for an NFL game in Florida, the severe weather alert chime may be just another white noise in a very busy room.